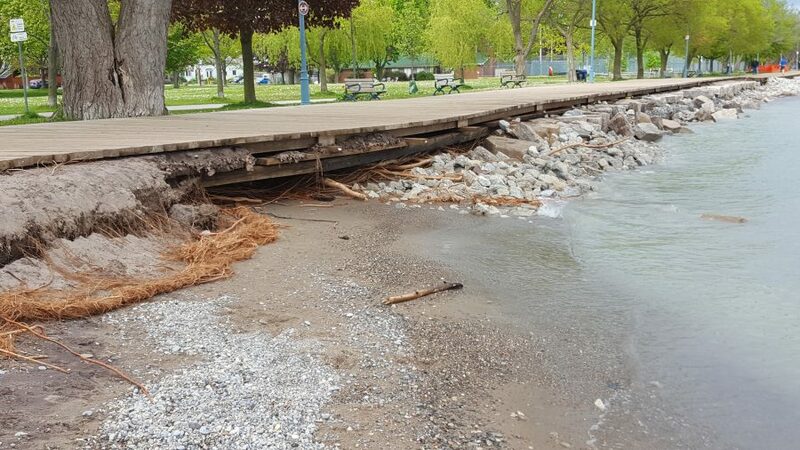 As yet another June rainfall pelts against my windows, I am thinking about the still flooded Woodbine Beach, and photos and film footage I have seen of the Toronto Islands underwater. I know I am not the only one worrying about this year’s disturbing spring weather and how it affects homeowners, nature lovers, motorists, wildlife and all of us, really. The City of Toronto published two reports, Resilient City: Preparing for Extreme Weather Events (2013) and Resilient City – Preparing for a Changing Climate (2014), both adopted by city council, that outline actions to improve the city’s resilience to climate change and extreme weather events. Included in these reports are weather and climate-based observations and patterns, which predict that the overall climate and weather patterns for Canada and Ontario will see shorter, milder winters, and hotter, wetter summers. We should expect overall more extreme weather events – meaning more extreme weather in total quantity, as well as those being more severe. For example, by 2100, Toronto is expected to have up to 65 days per year with temperatures exceeding 30C. I like warm weather but that sounds like too much of a good thing. At this point, I want to explain some terminology, as I have heard and read climate deniers saying that all the rain or other extreme weather we have had over the past 10-15 years is “just the weather” (not climate change), and 100-year storms have always been around. NASA says, “the difference between weather and climate is the measure of time for each. Weather is what conditions of the atmosphere are over a short period of time, and climate is how the atmosphere ‘behaves’ over relatively long periods of time. When we talk about climate change, we talk about changes in long-term averages of daily weather. As per NASA’s explanation, when you get extreme weather events more often than every 100 years or so (i.e. the so-called “100-year storm or flood” that has statistically a one per cent chance of occurring in any given year), then the weather itself indicates a long-term pattern. In this case, it can show a changing climate. And while it is true that historic evidence shows every century seems to have one or two 100-year weather events, we have had numerous such extremes in the past couple of decades, indicating a new and disturbing pattern. The marvelous TVO Climate Watch Shorts, which are 4-5 minute documentaries, cover various environmental topics including climate change and how it affects Torontonians. And affect us it does: The Insurance Bureau of Canada states that the July 2013 storm that flooded the Don Valley and shut down its GO train line cost the City of Toronto around $940 million. Insurance companies are having to cover increasing numbers of claims, and we all know what that does to our collective insurance rates! For anyone who scoffs at climate change and its effects, and thinks they needn’t participate in making any changes themselves because they think it is a hobby-horse of die-hard environmentalists, may want to consider that what we are experiencing is not just an environmental issue, it is an economic issue, and a health and safety issue, and therefore affects everyone: locally and globally. Whether we believe in climate change or not, we are and will all be affected by the losses and costs from the effects of more severe weather events. You need only look at some of the many ways that our recent extended rainfalls and floods in May and June are affecting Toronto: beaches, boardwalks and lakefront structures are damaged; homes, a zoo, amusement park, concert stages, infrastructure and more are flooded and damaged on the Toronto Islands, keeping them closed and any children’s summer camps, concerts and sporting events cancelled or relocated for most of the summer, also affecting sales and the likelihood of the island restaurants, cafes and cycling rentals etc. Students and adults have lost summer jobs, as a result of cancelled camps and activities. Some boat and yacht clubs have limited access to their vessels, as any fixed jetties and electrical wiring are in the water. 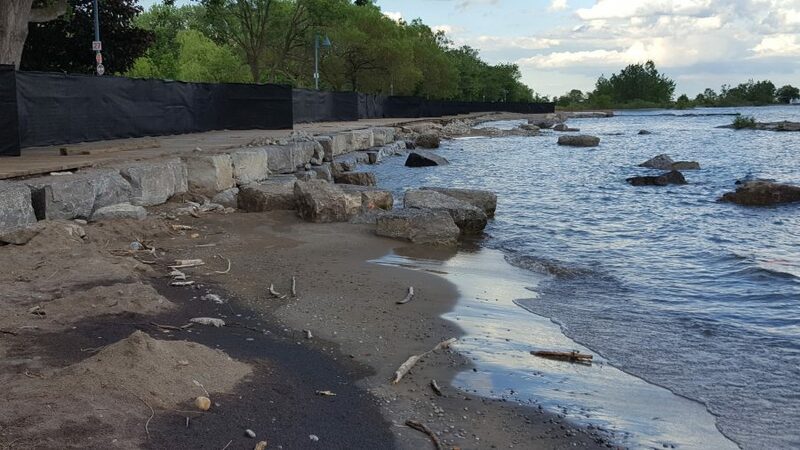 And the city is spending large sums of money on repairing and protecting the waterfront and riverbanks from further erosion with additional storm barriers, and repairing roadways and paved foot paths that may have slipped away. Other cities and countries are experiencing the same effects. Can you truthfully say that none of this affects you or your family? Our wildlife, its habitat, and overall health of ecosystems are also affected: Shorelines that are required for nesting or feeding are flooded. Floodwater carries debris and more pollutants, and excess water can dilute or flush away nutrients and mineral deposits. Sedimentation and the water’s turbidity (speed and turbulence of water flow) can result in more algae and phytoplankton blooms, affecting water quality in weeks or months to come. The wildlife that will be laughing are mosquitoes! All the standing water is providing a prime breeding ground for those pesky and potentially disease-carrying insects we all loathe. That will be another inconvenience or health safety issue that may arise, literally, now that warmer weather is here. On a positive note – and as is typical when a negative for one species (humans) becomes a positive for another species – more mosquitoes mean more food for other animals, like birds and other creatures that feed on insects. A silver lining, perhaps. Amongst those concerned about human contribution and causes are of course scientists. When US president Donald Trump took over the White House, Americans and Canadians were so concerned that his climate-denying administration would delete previous climate science data, that organizations across North America sprang into action to save valuable climate change data. This included local science historian Matt Price, of the University of Toronto, who started Toronto’s data archiving mission. This year’s extreme weather is certainly troubling me and many others. I encourage you to you continue doing what you, your family, and community can do to reduce and prepare for local impacts of a changing climate.